Saffron, Roli, Rice, Pan, Supari (betel-nut), fruits, flowers, milk, Kheel, Batashe, Sindoor (Vermillion), Coins, Cloves, Coriander, Cardamom, Incense, Jaggery, Gangajal, Coconut, Five Gems, Wheat, Sandalwood, Perfume, Urn, White Cloth, Panchamrit, Lotus, Kuber Yantra, Shri Yantra, Picture or idol of Lakshmi Ganesh, Silver Coin, Sweets etc. Dhumawati puja should be performed a place where you keep your money or safe. Purify the place with gangajal and make a rangoli with beautiful colors and flowers. Take bath in the evening and wear new clothes before commencing the prayer. 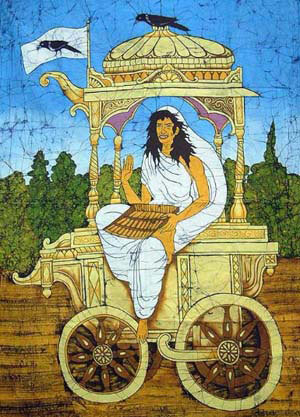 "Om Dhoom Dhoom Dhumawati Tha Tha Phat Swaha"
Goddess Dhumavati is one of the fearsome aspect of the Dasamahavidyas. Dhuma means smoke and Dhumavati is the one who is composed of smoke. She is the knowledge that comes through hard experience in which our immature and youthful desires and fantasies see an end. Her nature is not illumination but one of obscuration. However to obscure one thing is to reveal another. The significance of this is that by covering all that is known, She reveals the depth of the unknown and the unmanifest. She covers what is evident in order to reveal the hidden and the profound. She is often depicted as a widow who is the feminine principle devoid of the masculine principle. She is Shakti without Shiva as a pure potential energy without any will to motivate it. Thus she contains within herself all potentials and shows the latent energies that dwell within us. To develop those latent energies we must first recognise them which requires honouring Dhumavati. She represents the feminine principle of negativity in all the aspects of life. On the outer level she represents poverty, destitution and suffering and all the misfortunes that we all fear in life. It is because of this reason, she is regarded as crooked, troublesome and quarrelsome. But if we look deep into this phenomena, it is the same negativity which causes us to seek a greater fulfillment that can be achieved in the limited realms of the manifest creation. It is only when life seems desparate does one look inside to find the truth. It is believed that married people should not worship her . But the tantra sadhakas continue to worship her in many places.